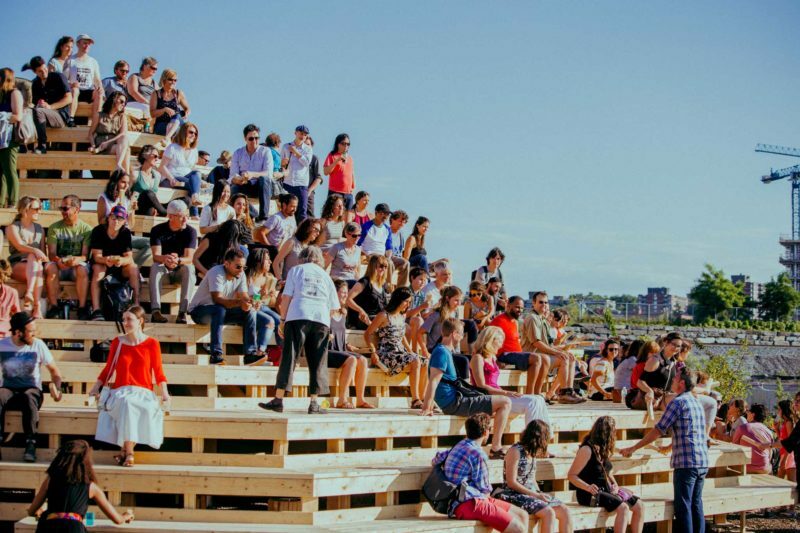 The Mont Réel is a collectively raised mountain that emerged during summer 2017 at the site for ephemeral projects of the future Campus MIL, the new science campus of the Université de Montréal. 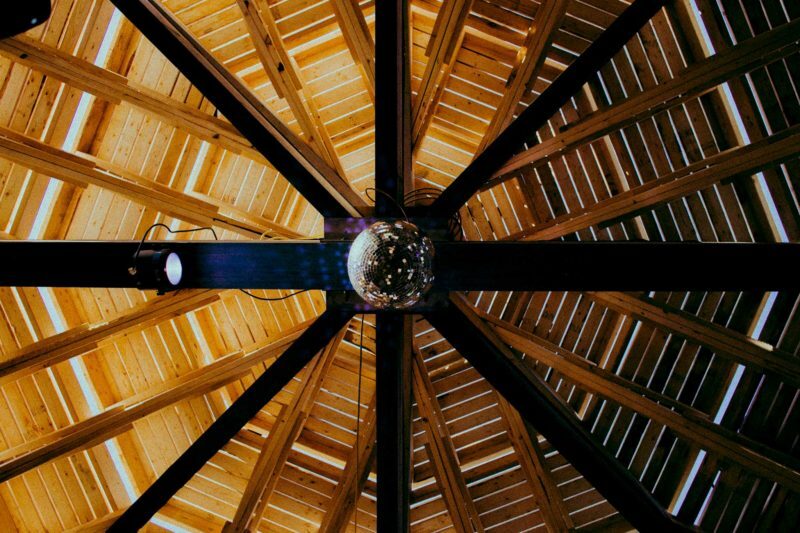 The wooden structure provides a place for locally active initiatives, communities and creatives from all-over to gather, experiment, exchange at, and contribute to the exploration of Mont Réel. 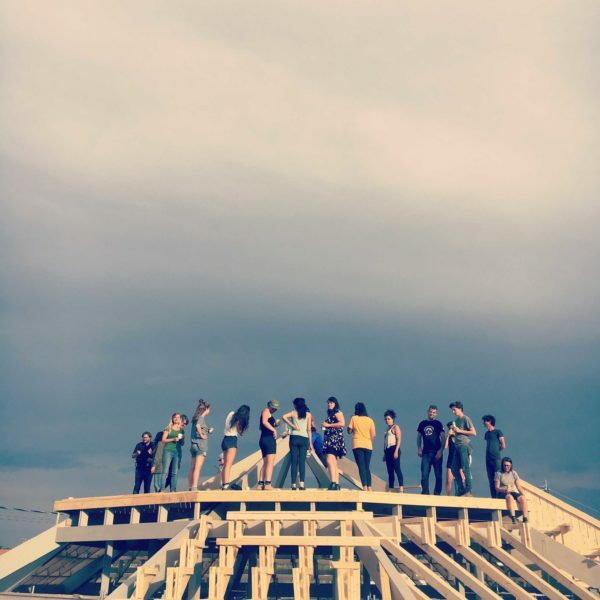 From 26th June to 16th July 2017 the “atelier collaborative” came together to organize a variety of collective actions around the building of the wooden structure, ranging from graphics and signage, conducting popular science experiments, making sound explorations and singing performances, as well as, preparing big feasts and experiencing moments of togetherness. Mont Royal has attracted our attention for its strong presence within Montreal’s cityscape, the historical meaning that it once represented and the various recreational activities it offers to the local population in summer and winter. But why “Royal”? The reference to royalty is directly linked to the history of colonisation and the kings of Europe, but throughout the centuries language and ideologies evolved and the old colonial symbol got defused. A contemporary socio-political reality took its place and the Mont Royal became a Mont Réel. On the contrary of an elitist property, the Mont Royal is nowadays a popular gathering space for Montreal’s mixed population, who uses it for recreation, games, sports, discovery, teaching, political manifestations and all kinds of cultural events. Campus MIL is located rather central in the city of Montreal and is surrounded by neighbourhoods with very different economic and social fabric. Parc Extension, Outremont and Mile End (Ex). 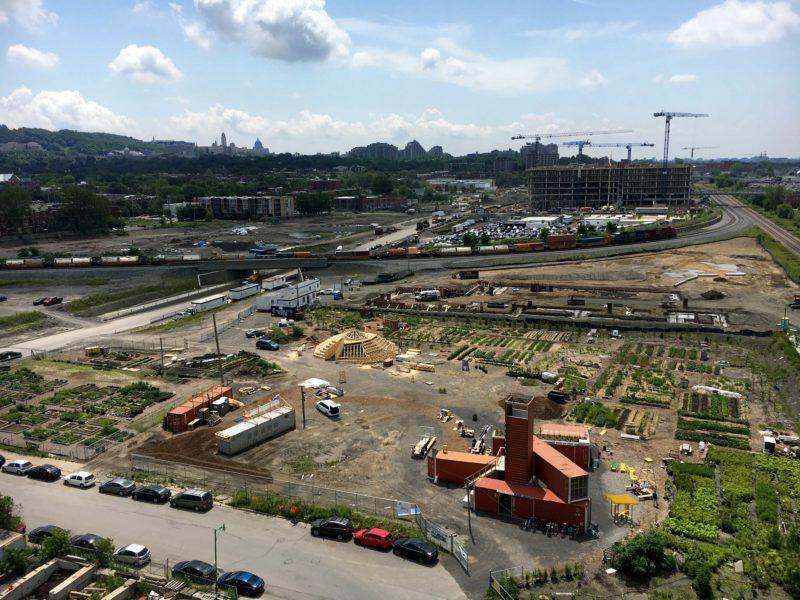 Community gardens, the Virage, Bioma Coop are engaged initiatives and already active onsite. It is them and the inhabitants in the neighbouring districts who the Mont Réel was built for, ready to be integrated into their daily lives through creative uses. 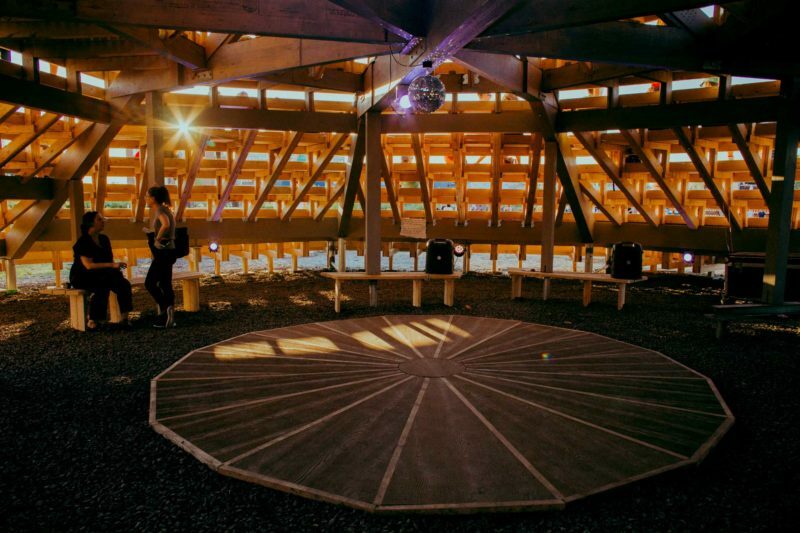 The Mont Réel is conceived as a relief, a 360-degree tribune or a gigantic concentric staircase that also provides an interior, the mountain’s grotto, shaded and calm. Built to be a supporting structure the Mont Réel provides space to explore similar characteristics as its reference, the Mont Royal. Its slopes are modest and the ascent to the Mont Réel is not a matter of glorifying conquest in high altitudes, but rather a joint celebration of the poetic and popular power of gathering. We proclaim that the peak be conquered by the local and collective creative forces! 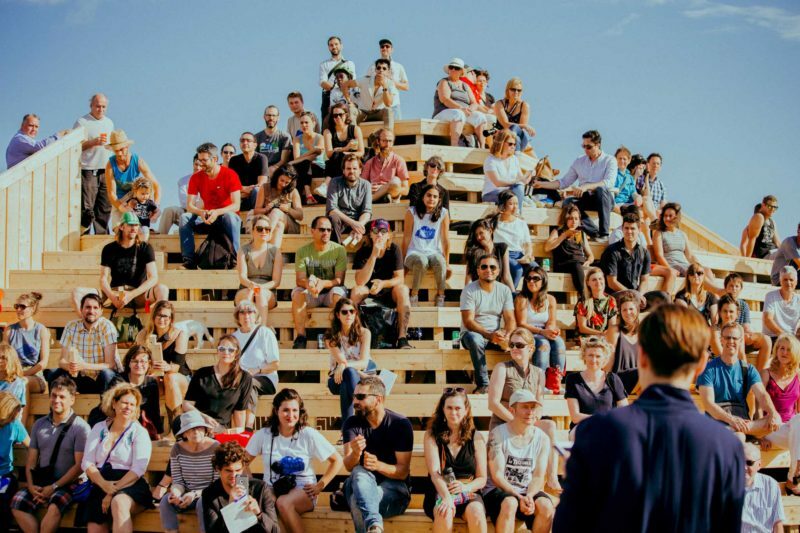 The range of potential uses is large: from a locally called 5 to 7 aperitif in the sunset, to gatherings and any form of artistic expressions, presentations or performances. We are very curious to follow up on the propositions for the Mont Réel. The story of this Mountain is yet to be written! 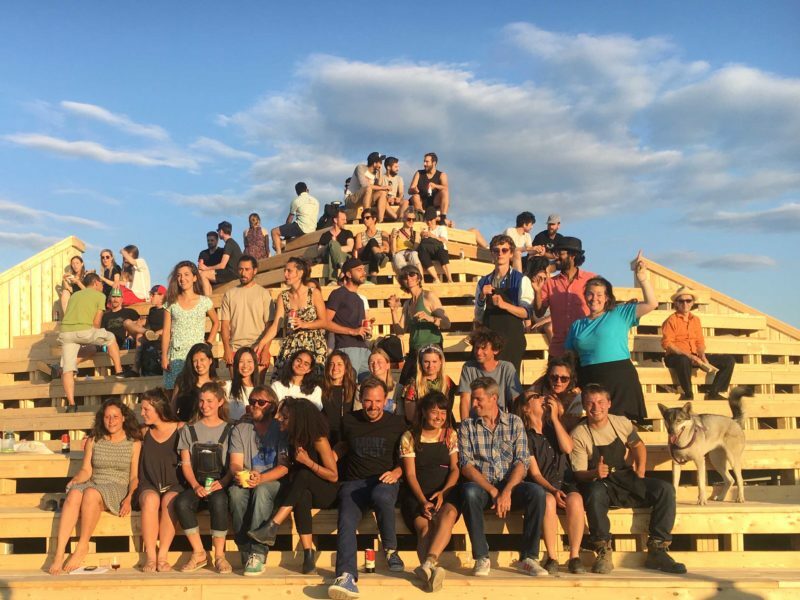 About 40 mountaineers of various backgrounds such as local and international artists, designers, engineers, builders, and students joined the “expedition” called for by constructlab and gathered at the future Campus MIL for the wood-workshop “atelier pour déplacer des montagnes”. 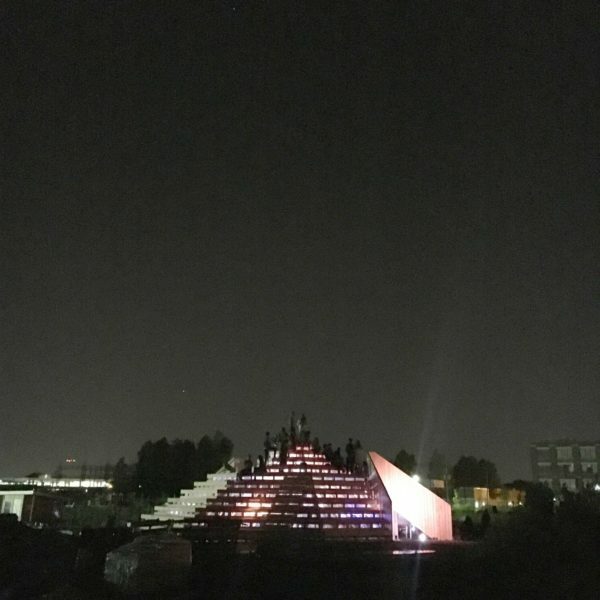 They had three weeks to build a mountain! For this task, they were equipped with 20 screwdrivers, three cross cut saws, handsaws, jig saws, planers, sanders, and lots of screws. 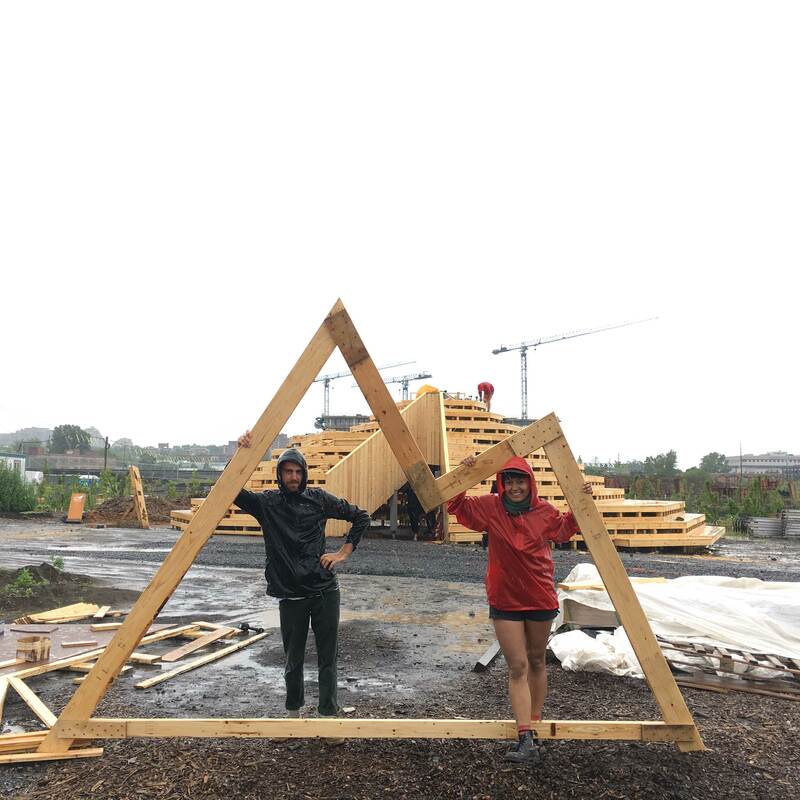 For 21 days, 20 of the mountaineers worked every day to raise the five metres high wooden structure, 16 metres in diameter, for which they used 6 km of wooden beams and more than 50.000 screws. 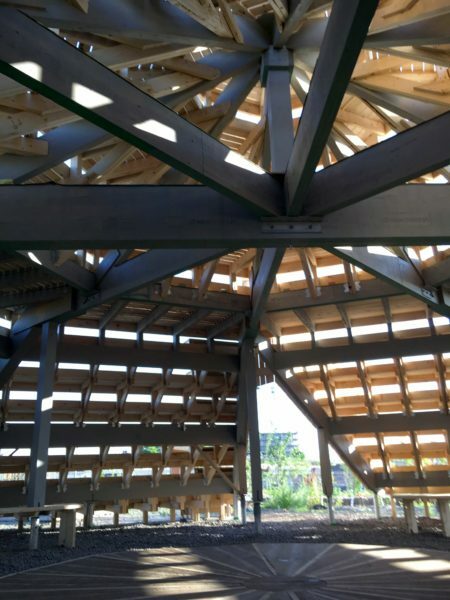 However, the aim of the atelier collaborative was not only to build a wooden structure but to prototype ideas for future uses together with future users by conducting a series of workshops in different domains in parallel to the actual construction work of the wooden support structure, the Mont Réel. 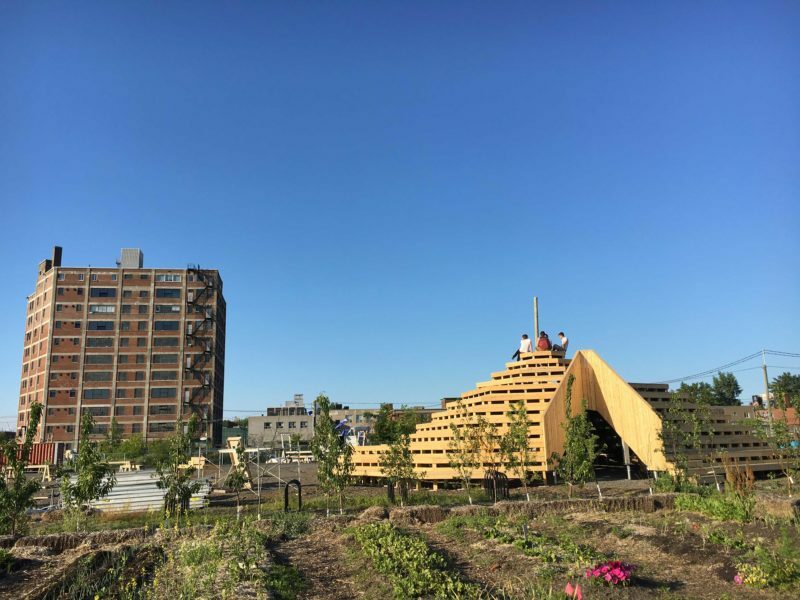 While the mountain as an idea was the central theme for the workshop series of atelier collaborative, the broad participation of the public was of central importance. 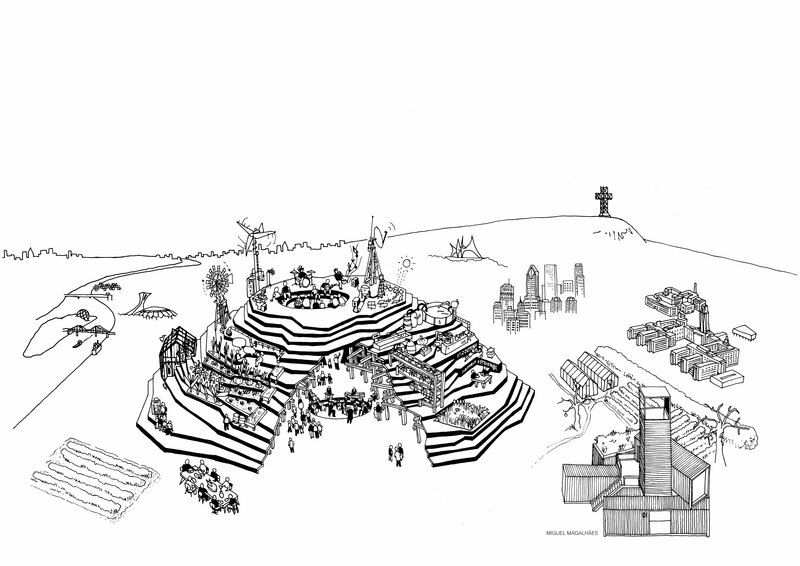 The participatory workshops included a graphic workshop, during which a signage system for the site and its surroundings was developed, as well as, pictograms to screen-print on t-shirts, posters, and other “mountain souvenirs”; and a series of singing, soundscape, and drumming workshops that helped compose the inaugural sound performance for the opening of Mont Réel. 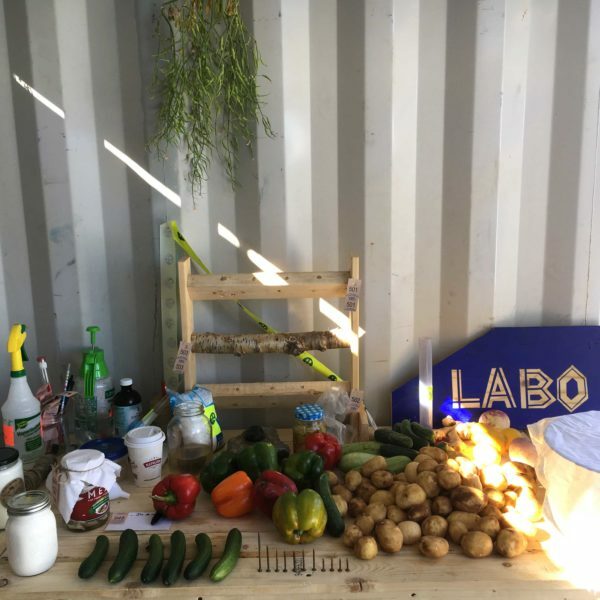 Further to this, we jointly installed a laboratory for fermentation as our contribution to the future scientific research purpose of the campus MIL, creating a connection with the nearby gardens to our project, the Mont Réel. 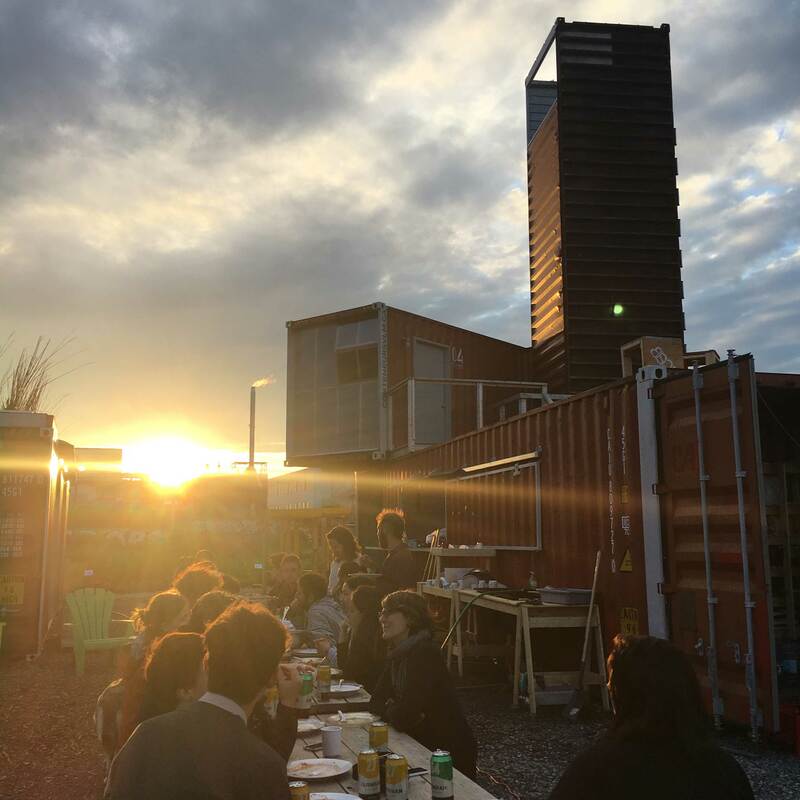 Throughout the atelier collaborative all participants enjoyed a daily cantina sharing laughs, tears and ideas around the table. Have a look on the project’s blog to get more insights on the different workshops and the atelier vibes. Mont Réel is conceived and designed by Constructlab, in collaboration with de l’Aire, AgrafMobile and les commissaires anonymes. Initiated by the Goethe-Institut Montreal in partnership with the Consulate général de France à Québec and the Université de Montréal. We got a huge support from the Quebec wood and forest company network coordinated by Cecobois!